The Baron De Rothschilds is a reference to the size of the cigar, in this case being a lancer-sized cigar, which means that it is long, albeit a bit thinner than the average cigar. If you’re looking for a long cigar that you will be able to enjoy smoking for an hour or so, this may be exactly what the doctor ordered (or would order, if he weren’t so uptight about cigar smoking). Macanudo is not a new name in the cigar world, but rather an old and practiced hand. In fact, they were one of the best brands out of Cuba for a long time, operating out of Havana. Founded by a German, he designed their cigars, with the help of local masters, to make sure that they would appeal to the Europeans, who he felt were, in the mid-1800s, an underserved market, one that deserved more pandering in the flavor of cigars. 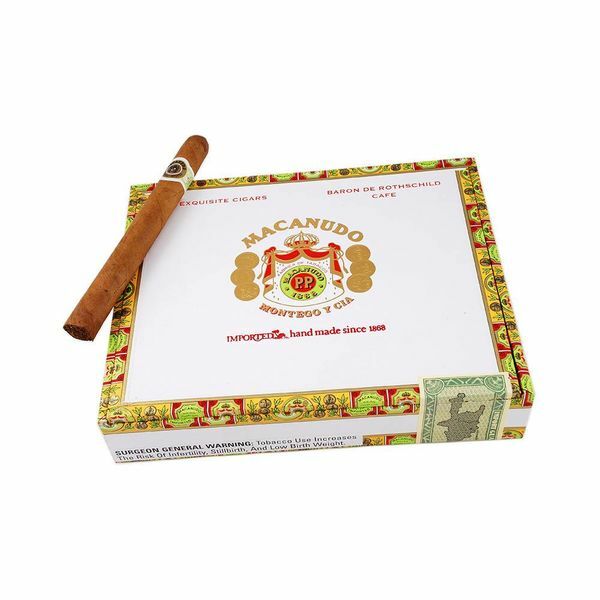 Macanudo cigars were that cigar, and they continued to be loved in America and Europe right up until the communist revolution in Cuba. Today, their cigars are made outside of Cuba, by a company unrelated to the Cuban state-owned Macanudo, but they are none the worse for the transition, and picked up right where the nationalization left them. 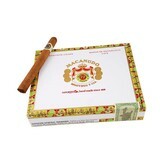 Their Café line combines a Connecticut Shade wrapper with tobacco from the Dominican Republic, and along with binder grown in San Andres, Mexico, it is a formidable, albeit light, cigar, one that is light enough for a newcomer to the cigar world, but one that is complex enough for an old hand.